Christianity is about love – God’s desire to have a companion whom He could love and who could love Him in return led Him to create Adam. God loved Adam enough to create the birds and animals to keep him company and for him to name and care for. He also loved Adam enough to create a wife for him, so that as husband and wife, Adam and Eve could grow in love together and grow in their love for God. What better way to express this key element of your faith than in the exchange of Christian wedding bands and rings during the sacrament of matrimony? The exchange of wedding rings was not always a part of the Christian marriage ceremony. In fact, it did not actually exist as a custom until the late 9th century, and it began with the Greeks and the Romans as the final gift in what was a long series of gifts throughout the betrothal. In the prayer book of Edward VI, the exchange of rings acknowledges the gift of the wedding rings as part of a larger gift by mentioning not only the exchange of rings, but also a purse full of gold pieces as part of the wedding contract. In today’s Christian ceremonies, the wedding ring symbolizes far more than a simple contract. Contracts are legal, binding, secular arrangements. Marriage is eternal. It cannot be broken by man. The ring you choose speaks volumes about you and your priorities. 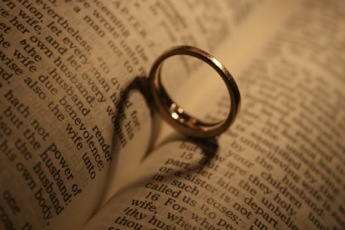 Choosing a Christian, wedding ring shows that you put God and Faith first, above all else, in your marriage. With God and Faith, all other issues can be worked through to resolution. Your ring symbolizes your commitment to your faith, to your spouse, and to the belief that, with your spouse your faith will strengthen, and with your faith your marriage will strengthen. The simplest of Christian wedding rings are unadorned gold or silver bands, possibly inscribed with a religious verse that has significant meaning to you and your spouse. Another option would be to have a religious design on the rings such as a cross or a fish. Whatever symbol will remind you that God’s love encircles your marriage is a terrific choice for a wedding ring. A modest gold wedding band for her in silver ranges from $20.00 to $50.00; yellow gold or white gold ranges from $97.00 to several hundred dollars. Platinum bands for her range from $262 to $1300.00. For him, unadorned silver wedding bands range from $40.00 to $150.00; an unadorned gold wedding band in yellow gold or white gold ranges from $200.00 to $525.00. Platinum bands for him range from $639.00 to $2000.00. Any of the online shopping sites such as Amazon or price shoppers will provide a wide range of styles, sizes, and prices so that you can find the ring you love at a price you can afford. E-weddingbands.com can engrave your wedding band with a personalized religious message for $7.50 for up to sixty characters and spaces. Mr. Avery began his career as a fighter pilot in World War II. Following his years of service, he pursued his education. At one point in his life, he considered a career in teaching. Then, after a life-long commitment to agnosticism, Mr. Avery returned to the Church and dedicated his life to God. His jewelry designs are understated yet powerful messages regarding the importance of Faith in every aspect of life, and especially in marriage. All of the following rings are for both men and women. The God Be With Us band is a pointed reminder of your faith in your marriage. It is available in sizes 5 to 13, and features the inscription “God Be With Us Together And Apart” encircling the ring. The band is $63.00 in sterling silver, $199.00 in a 14-karat gold and sterling silver combination, and $499.00 in 14-karat gold. The Faith, Hope, and Love ring is an intricate reminder of the three most salient aspects of married life. The words appear in openwork, with a cross separating love and faith to symbolize the Christian faith, an anchor separating faith and hope to symbolize hope, and a heart separating hope and love to symbolize love. Please order the correct size. Because of the openwork nature of the ring, it cannot be re-sized. It is available in sizes 5 to 13. The sterling silver band is $63.00, and the 14-karat gold band is $419.00. The Cross band with diamond is an unpretentious and elegant choice. The raised cross is the symbol of faith with a lovely diamond set in the center. The raised cross runs the length and width of the ring. It is available in sizes 5 to 13. The sterling silver band is $229.00, and the 14-karat gold band is $719.00. The Crown of Thorns wedding band is a constant reminder of all the Christ suffered for us. The thorns and branches are raised and run the length of the ring on a burnished background. It is available in sizes 5 to 13. The sterling silver band is $63.00, and the 14-karat gold band is $539.00. James Avery rings may be ordered online or through their website. They can also be purchased at their retail stores in Texas, Alabama, Colorado, Georgia, Louisiana, Oklahoma, and Tennessee. Jewelry Vortex is an online store that offers a number of tasteful, beautiful, and faithful Christian wedding rings, as well as other jewelry. The prices are discounted, but the quality remains high. The Jewelry Vortex also offers engraving. Because this is an on-line shopping site, not all rings will be available in all styles and all sizes at any given time. The styles described here are available as of the time of this writing, and all of the rings described are for men and women. The Titanium Cross ring measures 7mm wide. The band is a brushed finish, with the carved crosses a polished accent. This ring retails for $179.00, but is available on Jewelry Vortex for $69.95. The Tungsten Beveled ring measures 8mm wide. The band is a brushed finish with a polished and beveled edge. Alternating crosses and fish remind the wearer of his dedication to Christ, the Fisher of Men. The suggested retail value of this ring is $260.00, but it is available on Jewelry Vortex for $119.95. The Lord’s Prayer ring measures 9mm wide. The band is a highly polished 14-karat gold bearing the words of the Lord’s Prayer encircling the ring, and enveloping the raised cross in the center of the ring. The suggested retail value of this ring is $1,080.00, but it is available on Jewelry Vortex for $599.95. The Rose and White Gold Cross ring measures 7mm wide. The band is a highly polished white gold with an inlay of rose gold encircling the ring. Simple raised crosses of the rose gold remind the wearer of Christ’s importance in the marriage. The suggested retail value of this ring is $690.00, but it is available on Jewelry Vortex for $379.95. A Christian wedding ring fits your lifestyle. Be sure that the ring itself fits your finger. Plain bands can generally be re-sized either larger or smaller by one-half size without affecting the ring’s design or strength. Rings that are etched, inscribed, or have a design should not be re-sized as it will affect their appearance. To re-size a ring down to a smaller size, the jeweler must cut the excess gold from the band and re-solder it, and polish it so that the seam is invisible. To re-size a ring to a larger size, the jeweler must stretch the ring, elongating the metal and decreasing the ring’s strength due to making it thinner. When choosing a ring size, try several different sizes on your finger. The ring should easily slide over your knuckles, but not be so loose that it will fall off. Bear in mind that your ring size will probably change as you age. If you plan to wear your wedding ring constantly, remove it every few months to be sure you are still able to do so. If your ring is just a little tight, hold your hand above your head for a few minutes to encourage the blood to flow out of your fingers and try removing it again. If that does not work, try using soap and water to lubricate your finger and enable the ring to slide off. Whatever ring you choose, from whatever jeweler you like, a Christian wedding ring will set you apart from the crowd. While others may drool over how many carats are in the center diamond, and whether or not he actually spent three months’ salary on her engagement ring as the commercials say he should, you know that, by putting your faith first, your marriage will last longer than the payments on the flashier rings. Your quiet, subtle reflection of your faith as expressed on your wedding band will place the joy of the occasion and the commitment of your life where in belongs – in the hands of God.